Y’all, are you aware that Memorial Day is next weekend? I honestly can’t believe it, myself. This year has just *flown* by, and the only reason I can really accept that it’s actually Memorial Day weekend coming up is that The Brit and I are going to Florida Keys for five glorious days. It’s our first time, and I’m so excited! If you have any tips, restaurant recommendations, or photo spots for me, please make sure to leave them in the comments. But before I jet off into the sun, I want to make sure you have your Memorial Day recipes on lock down. This super easy, super simple, absolutely delicious salad is a favorite of my nan’s. She keeps a tupperware of it on the go in her refrigerator at all times, topping it up with more of each of the ingredients as it starts looking a little sparse. 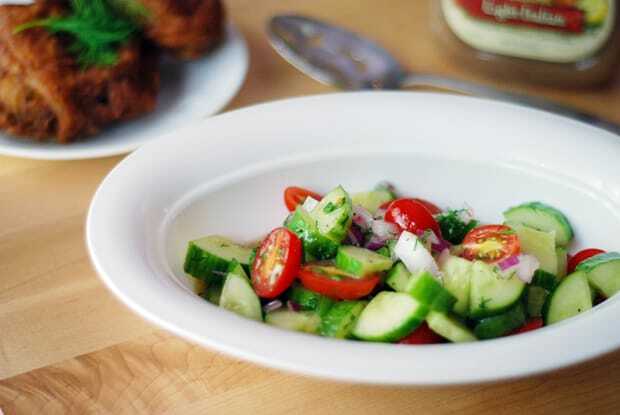 The beauty of this cucumber and tomato salad is that it comes together in minutes, but gets better the longer you let it sit. You can eat it five minutes after you make it, or five days. It’s the perfect side to barbecue, fried chicken, or anything else you’d like to serve up this Memorial Day Weekend. Serve it along side Nan’s Famous Potato Salad, and some brisket. My mouth is watering just thinking about it! The recipe is really more of a formula, so feel free to divide or multiply in accordance with however much you need for your crowd. Half and then quarter each cucumber, and then chop into 1/4″ pieces. If you’re serving small children, or just prefer it, also halve the Grape tomatoes (You can also use cherry tomatoes, but I would definitely halve those). Chop the red onion very finely, and then mince the dill. Add all items to a medium bowl, and sprinkle with salt and pepper. Add the Italian dressing and stir with a serving spoon until all the vegetables are covered evenly with salad dressing. You can add more or less dressing depending on your own preferences. This mixture is also handy to keep around for adding on top of other salad greens. 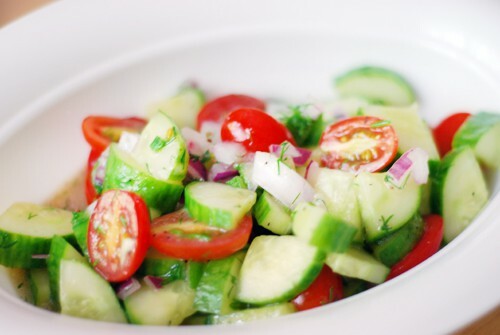 This keeps best in the refrigerator and served cold, but it isn’t required to keep it cold at a barbecue like you would have to do for other mayo-based cucumber salads. Enjoy with a cold beer and flavorful brisket on a hot day. I love this stuff. Thanks for the recipe. Ohh the year is flying by! This salad looks fabulous. Good stuff, and you have me all excited because it brisket weekend here! Its memorial Day and graduation! Have fun on your trip. I really hope you’ll post your adventure. I am jealous that it’s brisket weekend. I have to smoke it myself if I want brisket weekend around here. And we haven’t taken the plunge and bought a smoker yet. Its a very colorful salad. I can’t believe how this year is flying by either. This looks like the perfect lunch ever…it’s so much fun taking produce out of your own garden. So much more fun that out of a grocery cart! Thanks for sharing this. What a wonderful reminder that gardens are coming alive finally! I better start some cucumber seeds! Thanks! Yes, gardens are definitely coming alive. I wish I could grow things without the animals in the forest around my house laying waste to what I plant. I support the local farmer’s market instead. But I can just taste this salad with something fresh out of your garden! My favorite place to stay in key west is Southernmost on the Beach.Southernmost has 4 propetys together at the southernmost point. The On the Beach property is on the beach. It is at the end of Duvall and walking distance to many things. It would be my place to stay. Blue Heaven KW try the shrimp and grits or the lobster benedict for breakfast. It is worth the wait. There is a great sunset cruise on a schooner called the Appledore its resides in KW in the winter and ?Maine in the summer. Make sure to be on Mallory Square for a sunset. Ernest Hemingway House is interesting if nothing else but to see the six toed cats. There is a light house. I have always wanted to do the Dry Tortugas tour but it is a whole day and have not done it yet. If you are driving then when you are in Cujoe Key go to The Square Grouper. We have stayed at Tranquility Bay in Marathon. There is a great natural Dolphin Reasearch Center located in Marathon. Also I have heard Sparkeys landing in Marathon is good but have not been there. In Key Largo there is John Penekamp Park. reef, glass bottom boat, kayaks. can you tell I love the keys. Donna! You are a wealth of information! I am going to forward your comment to my husband so we can figure out how to visit most of these places. I’m a huge Hemingway fan, so we’ll definitely be visiting his house. Thanks, Tara. We’ve never been either. SO excited! It’s crazy how fast this year is flying by. I know I probably say that every year but it really seems like this one is even faster! I hope you two have a fabulous trip, I want to hear all about it! I know exactly what you mean, Sylvie. Don’t you worry, we’ll be taking LOTS of photos! Lovely and crunchy! It screams summer and I’m so so so ready for that. You and me both, Nancy! There is nothing better than a fresh salad on a warm day. This looks incredibly simple and delicious…I LOVE that keep sharing your Nan’s recipes. Keep ’em coming!